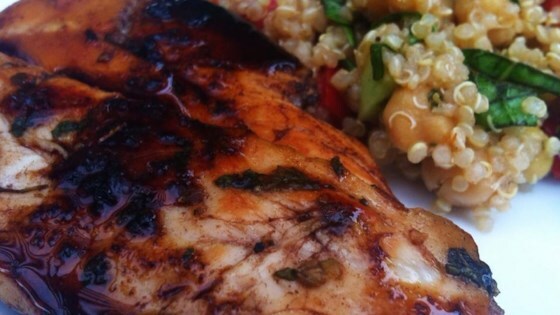 "A tasty, easy-to-make chicken dish -- my husband loves it. Sometimes I cut the chicken in strips,and serve over pasta." Whisk together the balsamic vinegar, chicken broth, sugar, garlic, and Italian seasoning in a bowl, place the chicken breasts in the marinade, and marinate for 10 minutes on each side. Heat the olive oil in a large skillet over medium-high heat. Remove the chicken from the marinade and reserve the marinade. Place the chicken in the heated pan and cook until they start to brown and are no longer pink inside, about 7 minutes per side. Pour the marinade into the skillet, and cook until it thickens slightly, turning the chicken breasts over once or twice, about 5 minutes. I made two batches of marinade.one for the chicken to marinade in and discarded, and the second for the sauce.Not a good idea to use any marinade that was used on chicken. I followed the recipe to the letter and it produced the most beautiful, moist flavorful white meat chicken. Wonderful alternative to the teriyaki/soy marinades. Thanks for posting. This was Delicious! We have tried many chicken marinades and this is one of the best...did not change one thing. The sugar made it baste so perfectly! This is a great recipe, unfortunately on my first try I was able to get the sauce to reduce because I let the chicken marinate too long, but on my second try it came out very well.